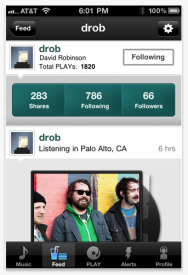 AOL on Tuesday released Play, a new social music app for iOS. Marketed as the Instagram for music, the app was first launched at SXSW, but was originally only available for Android phones. Now you can get it in the App Store, too. Play provides basic music listening, but also adds more social elements to the listening experience. You can rock out to any music on your iOS device from within the app’s interface—and also post to Twitter or Facebook about your songs, follow others to see what they’re listening to, and comment upon and “like” your friends’ songs. There’s free music on Play, too. The app’s Album Play section gives you access to certain full-length CDs in a CD Listening Party feature, select MP3s in MP3 of the Day, exclusive tracks from SXSW, and more than 47,000 Shoutcast radio stations. If you like to discover new music through other people, Play also lets you preview your friends’ songs through the app, iTunes, and Rdio. Play is available for free and requires iOS 4.0 or later.